The concert on Thursday 27th October is the result of a number of French music journalists attending the SPOT Festival – and their fascination with Danish music. At the two latest SPOT Festivals, large delegations of French reporters have turned up at the Danish festival, and after both festivals all the reporters were asked to make personal top tens of the best gigs. These top tens are now bringing three Danish bands to Paris. Thus, Powersolo, Spleen United, and Lampshade are going to Paris next week to play at the Paris club Le Point Ephémère on Thursday 27th October. Powersolo finished clear first in last year’s poll, and in fact they are already enjoying their fair share of success in France. Not only playing lots of concerts (they have just returned from yet another mini-tour), but also appearing on French television with “Juanito” making up the soundtrack of the current commercial for SNFC (the French Railway Company), as well as on the radio where the same track has just been added to the play list at France Inter and is to stay there for the next month at least. On top of all this, another track of theirs “Baby You Ain’t Looking Right” makes up the soundtrack of the new advertising campaign for Renault’s model Clio – needless to say the campaign is worldwide. Well, the French definitely seem to have acquired a taste for Powersolo. Spleen United finished in the top five at this year’s poll, and on that basis they have also been selected for the line-up at Le Point Ephémère. 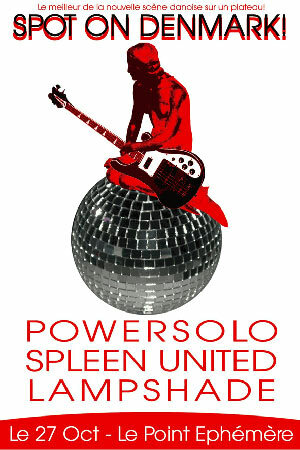 However, in contrast to Powersolo, Spleen United have no formal agreements or contracts in France yet, so for them the concert is a golden opportunity to kick in the door to that market. Lampshade for their part have already released a single as well as an album in France – reaping plenty of critical praise. For Lampshade the gig in Paris is an opportunity not to be missed – because the footholds that have already been created are too promising not to be followed up. ROSA/MXD is collaborating with the French agency Coup Franc! on the concert in Paris. Well in advance of the concert, Coup Franc! has sent out invitations to the relevant press/ media (magazines, newspapers, radio, TV) and the music business (publishing, record companies, management, musicians, etc.). Incidentally, it is also Coup Franc! with which ROSA collaborates to attract the attention of the French media to the Aarhus-based SPOT Festival including bringing French media and music business people to the festival. In addition to this, The Danish Embassy in Paris also works to whet its cultural connections’ appetite for the concert.